Will Eisner's Shop Talk. Buy at Amazon. 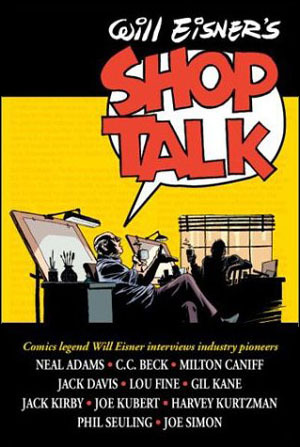 Will Eisner's Shoptalk (2001) features Eisner's interviews with Jack Kirby, Joe Simon, Gil Kane, Joe Kubert, Jack Davis, Neal Adams, C.C. Beck, Milton Caniff, Gill Fox, Harvey Kurtzman and others. When Eisner got together to chat with other masters of the medium, what resulted was an assortment of information vital to everyone working in the industry, and indispensable to anyone looking to get into it. Previously serialized in the now long out-of-print The Spirit Magazine and Will Eisner's Quarterly from Kitchen Sink Press, the interviews collected in this volume flow naturally into a compendium of technical secrets, light-hearted anecdotes and informative history lessons.